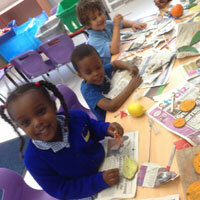 Bonner Mile End Primary School was opened in 2012 and is a new site for Bonner school, so it is partner to Bonner Bethnal Green, with the same Headteacher and many of the same staff. 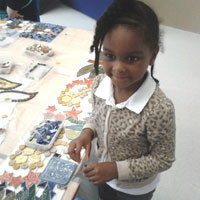 The Lottery sponsored a mural project with Artyface Community Art, just as they did for Bonner BG about eight years ago. 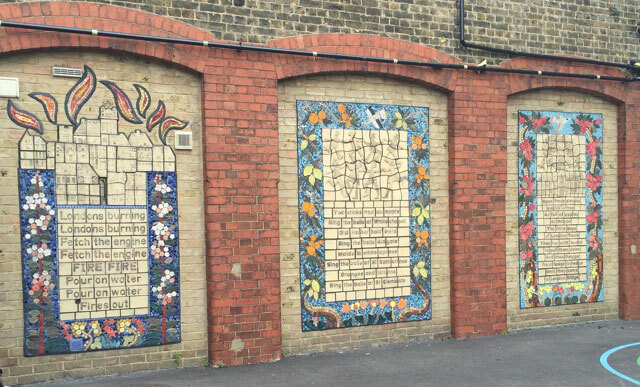 The Victorian school at Mile End has an old building in the playground with three bare brick arches, crying out for something to be put on them. 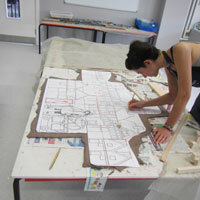 The artists found out from consulting with the school (thanks TC!) 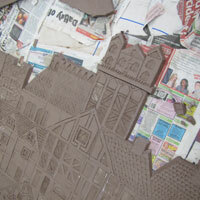 that it used to be a firestation with horse drawn firecarts. 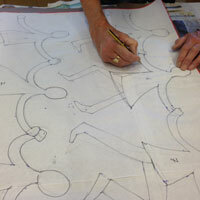 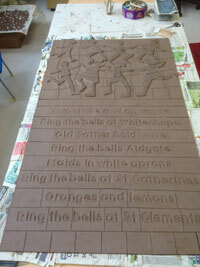 This sowed the seed for a 'Fire of London' nursery rhyme panel. 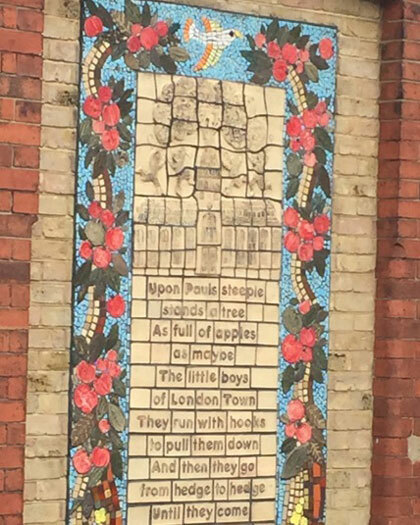 There were three arches so why not depict three London rhymes? 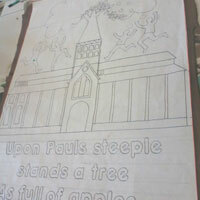 'Oranges and Lemons' was an obvious choice with great imagery, the St.Paul's one is old and original but lesser known, also with great imagery. 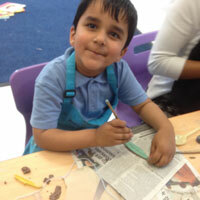 As the children were so little (Nursery, Reception and Year 1, every year there's a new intake and the school grows) we decided to do lots of clay as it is more accessible to this age group (mosaics are a little fiddly, gluey and frustrating). 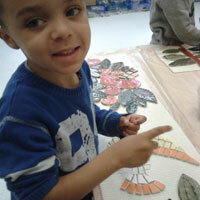 The pupils came to work with the artists making the oranges, lemons, leaves, and the Rose Willow herb flowers and leaves (it grows on sites of fires- it must like carbon) and the apples and apple leaves for the three borders. 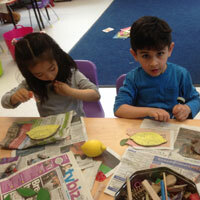 The children textured them and painted coloured slips onto them. 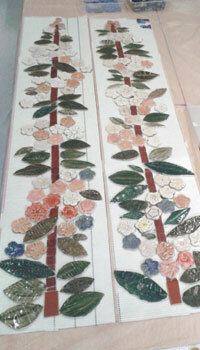 We glazed them and fired them. 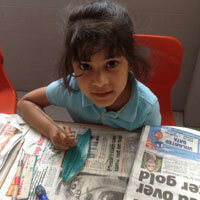 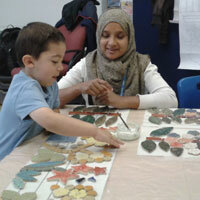 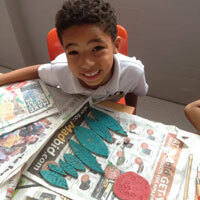 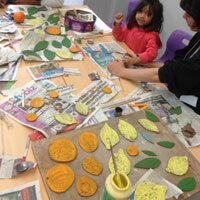 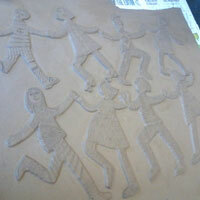 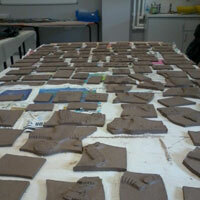 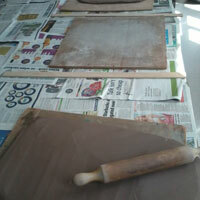 Parents and teachers came in to mosaic around the pupils' clay contributions. 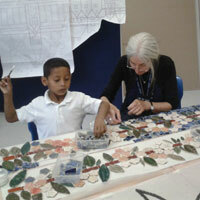 Older pupils did mosaicing too. 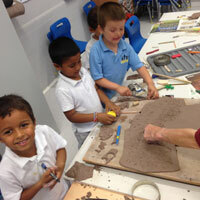 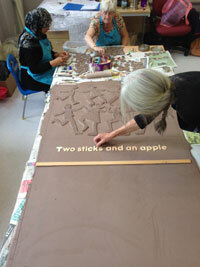 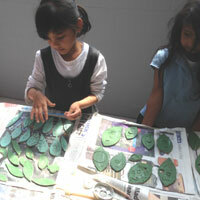 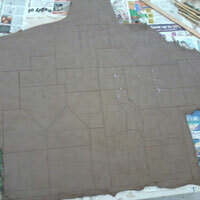 We then had help from parents and pupils to draw and make the clay figures and clay buildings depicting the rhymes. 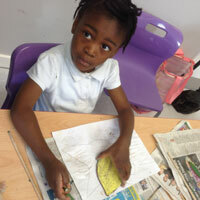 Pupils were regularly brought to have a look with their teachers, and came back in in small groups to have another session making. 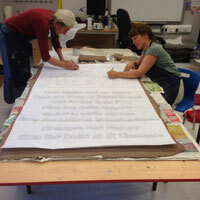 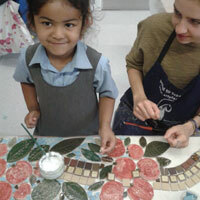 "The mural project at Bonner Primary School was an exciting project and has been completed to an excellent standard. 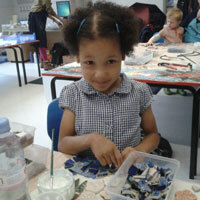 We, the artists, and the school community are all very happy with it! 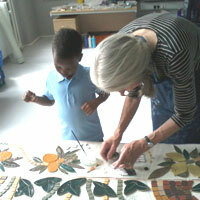 We tailored the project to be as accessible as possible to this age group. 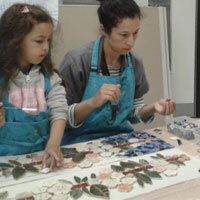 Parents and staff were also included in the making processes and we had some very keen parents who came back many times. 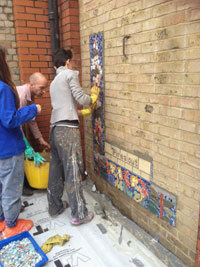 "The wonderful thing about the theme for the murals are that they tap in to the history of the building. 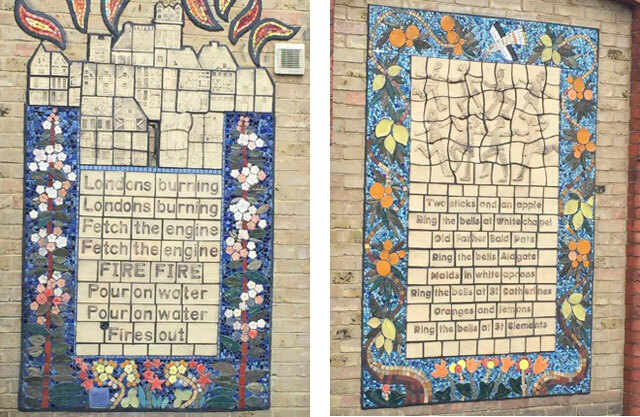 The three London Nursery Rhymes will feed into the school's curriculum with their history and also be used for the children to sing to, as well as the visual stimulation and literacy they will encourage during playtimes." 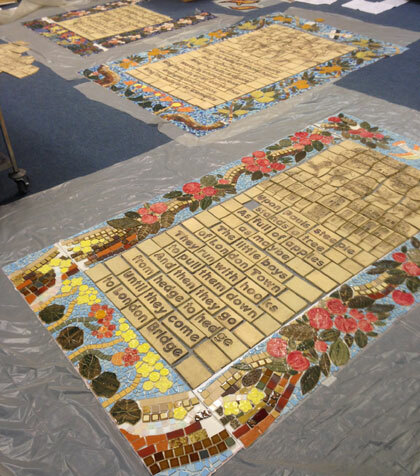 "The project was a great opportunity for the children and parents, staff and adults to learn new skills and be part of an historical art project. 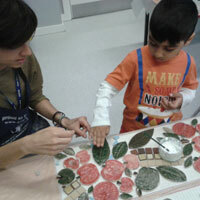 The project aimed to develop skills, citizenship, interaction and confidence throughout the project. 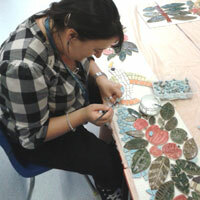 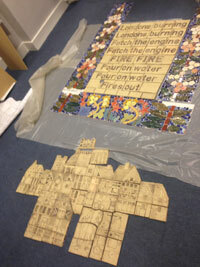 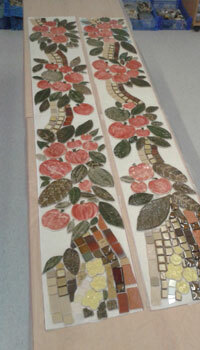 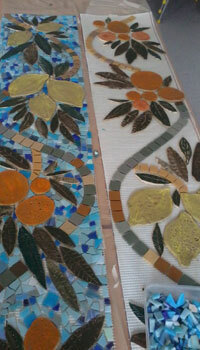 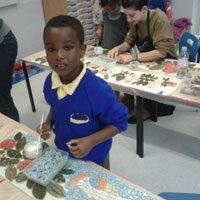 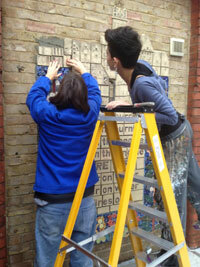 The mosaics have laid a firm foundation for engagement in local community, pupils and staff. 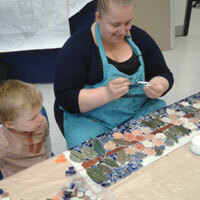 The enthusiasm, experience and knowledge of the mosaic staff has also been a critical factor in the success of the project. " 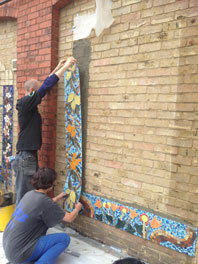 The finished murals in place in the playground.